Expedition 10 - Solar System Planets And Moons Section. The crew of Expedition 10. The crew of Expedition 10 arrived at the International Space Station. Expedition 10 Arrives at the International Space Station. The crew of Expedition 10 arrived at the International Space Station on Saturday, after a malfunction forced them to dock their Soyuz spacecraft manually. 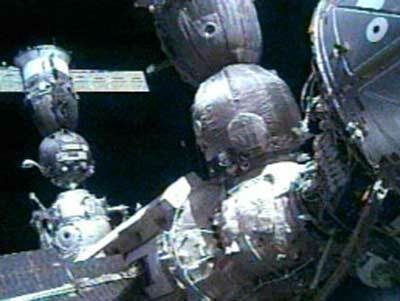 For an unknown reason, the spacecraft sped up when it was only 200 metres (650 feet) the station, so Salizhan Sharipov had to override the automated system, and complete the docking manually. Once the Soyuz TMA-5 was firmly docked to the Pirs airlock module, the three crew entered the station to a warm greeting by the two-man crew of Expedition 9; they're set to return on October 23.